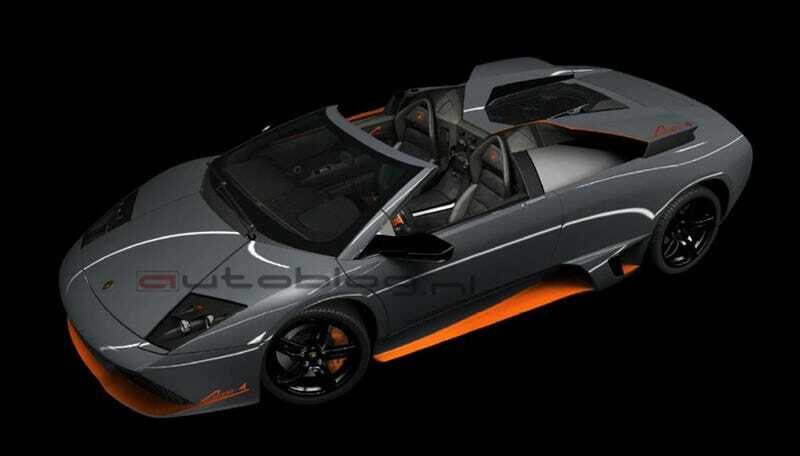 This silver-and-orange roadster is reportedly the Lamborghini Murciélago LP650-4, the uncovered sequel to the LP640. According to Autoblog.nl, there will only be 50 of these special edition, 6.5-liter V12-engined monsters produced. Full details have yet to be released, but we doubt Lamborghini will hold back on the latest super version of the Murcié. Expect the same 6.5-liter V12, but this time possibly pumping out power to the tune of 650 horsepower with a 0-60 mph time around, if not lower, than the LP640's 3.4 second run. Joining a probable power jump, we know the LP650-4 will get a host of luxurious upgrades including Nera Alcantara leather seats, the special paint job, Arancio Leonis stitching and piping and just about everything the wealthy bachelor needs. No word on where it's going to sale, but the early word is it'll cost around $400,000 for the privileged few who can even consider buying one.